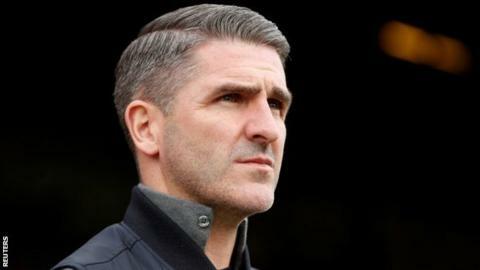 Ten-man Bury's 14-match unbeaten run was ended by improving Swindon Town, who triumphed 3-1 at Gigg Lane. Kaiyne Woolery scored two, made one and hit the post for Swindon, who boosted their own play-off hopes. Swindon struck first in the 25th minute when a weak header back to the keeper by Callum McFadzean was pounced upon by Woolery, who smashed clinically past Joe Murphy. Adam Thompson then headed Nicky Adams' corner against the Swindon bar, before Jay O'Shea sprinted down the left to cross for Nicky Maynard, who tapped home his 20th goal of the season from barely a yard out. In the 54th minute, O'Shea saw his superbly struck free-kick thump the bar but, at the other end, Woolery made it 2-1 to Swindon, battling his way past Scott Wharton and Thompson before scoring from 15 yards. The impressive Woolery then slammed a low drive against a post in the 66th minute as Swindon threatened to cut loose. Bury's Danny Mayor was red carded on 74 minutes when he reacted to Canice Carroll's challenge with a wild push on the midfielder before Robinson tapped home Woolery's cross three minutes from time - to secure a result which caused the Shakers to slip to third. Match ends, Bury 1, Swindon Town 3. Second Half ends, Bury 1, Swindon Town 3. Substitution, Swindon Town. Tom Broadbent replaces Kyle Bennett. Attempt missed. Kyle Bennett (Swindon Town) right footed shot from outside the box misses to the right from a direct free kick. Kaiyne Woolery (Swindon Town) wins a free kick in the attacking half. Attempt saved. Nicky Maynard (Bury) left footed shot from outside the box is saved in the centre of the goal. Goal! Bury 1, Swindon Town 3. Theo Robinson (Swindon Town) right footed shot from the right side of the six yard box to the centre of the goal. Assisted by Kaiyne Woolery. James Dunne (Swindon Town) wins a free kick on the right wing. Substitution, Bury. Gold Omotayo replaces Adam Thompson. Substitution, Swindon Town. James Dunne replaces Keshi Anderson. Attempt saved. Callum McFadzean (Bury) header from a difficult angle on the left is saved in the centre of the goal. Danny Mayor (Bury) is shown the red card for violent conduct. Corner, Swindon Town. Conceded by Callum McFadzean. Attempt blocked. Kaiyne Woolery (Swindon Town) right footed shot from the centre of the box is blocked. Corner, Swindon Town. Conceded by Joe Murphy. Attempt saved. Ali Koiki (Swindon Town) left footed shot from outside the box is saved in the bottom left corner. Corner, Swindon Town. Conceded by Jordan Rossiter. Jay O'Shea (Bury) wins a free kick on the left wing. Kaiyne Woolery (Swindon Town) hits the right post with a left footed shot from outside the box. Corner, Bury. Conceded by Kyle Knoyle.